Since the demise of Trover’s and the Barnes & Noble in Union Station, Capitol Hill has been bereft of new book stores for adults. Used book lovers still have Riverby, Capitol Hill Books, and the frequent sales at the Southeast and Northeast libraries. Fairy Godmother continues to serve the younger set. However, adults looking for the latest works are out of luck. And with the closure of the downtown branch of B&N, it seems that this problem is growing. However, a few new book stores in the area are bucking this trend: One More Page Books in Arlington, and Upshur Street Books in Columbia Heights, are two shining examples. Now, Hill resident Laurie Gillman is bringing a similar operation to her neighborhood: East City Bookshop. 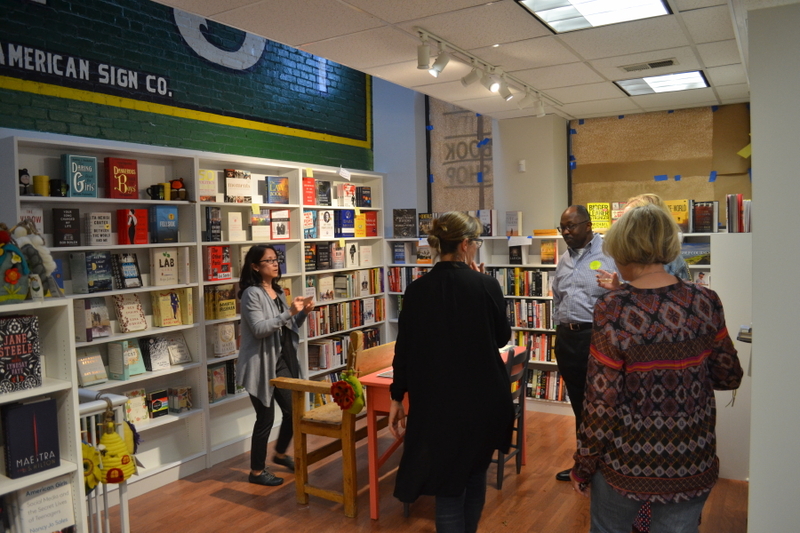 The new store, located at 645 Pennsylvania Avenue SE, will host a large variety of events, including at least two book clubs, one focusing on literary non-fiction, the other on fiction. The first event will be on April 30th, when the store celebrates its grand opening. There will be activities, author readings and even an ‘after dark’ event. The following day, the book store will be at handling sales at this years Literary Hill Bookfest, which is making its triumphant return to Eastern Market’s North Hall after a one-year hiatus. Last Thursday, they had a sneak preview, hosted by local authors Louis Bayard and Frederick Reuss. Gillman welcomed those lucky enough to get an invitation, and introduced her staff, including those who will be running the book clubs. While books line most of the walls, there is an inviting open space downstairs that will be used for events. Stop by, they had their soft opening this Monday, and be sure to come by on the 30th when you come by Labyrinth for their tabletop game event. We welcome the new store to the neighborhood, and look forward to it becoming an important part of Capitol Hill! Tags: books, bookstore, FUN, new bookstores, new retail, new stores, read a book, welcome, yay!